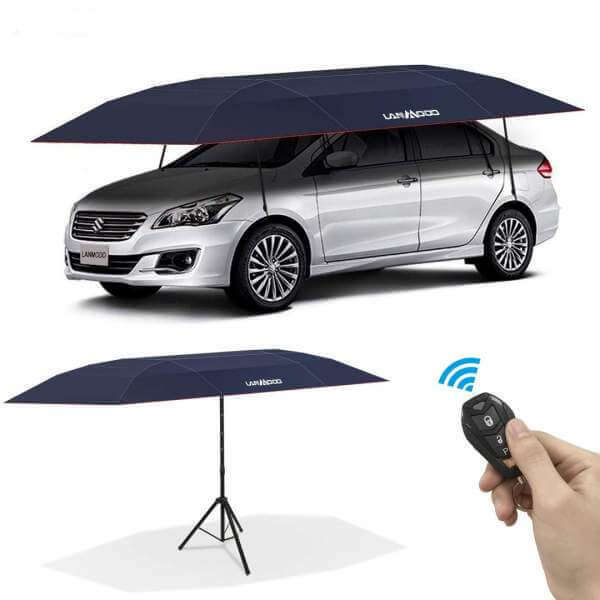 Possibly one of the most innovative products of 2018, the Car Umbrella is a functional, portable shelter that can be used on a wide variety of vehicles. I was first made aware of these by Insider and their Lanmodo video that went viral on social media, perhaps you too and maybe, that’s how you ended up here. Not just a fad product, they have genuine protective abilities due to the materials used. Able to reduce fading on the paint work of your vehicle is subject to persistent sunlight, prevent the car interior from overheating on hot days. Additionally they can protect the car from falling debris during autumn days and bird defecation. In winter it can help to reduce the icing of the car and keep the snow off, alleviating those morning scraping and clearing tasks. There are clearly various benefits, albeit some models perform better than others. Some dreadful products do exist due to the rise in popularity of this product, the rush in production closely follows this. 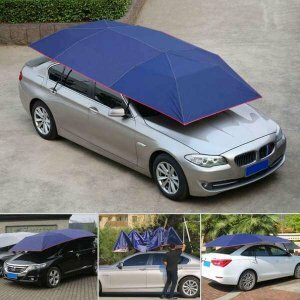 What is a Car Umbrella? 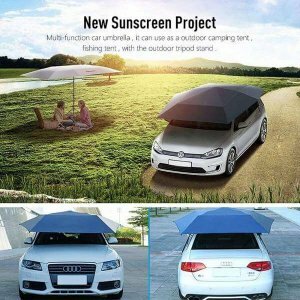 Why use a Car Umbrella? How to Install a Car Umbrella? 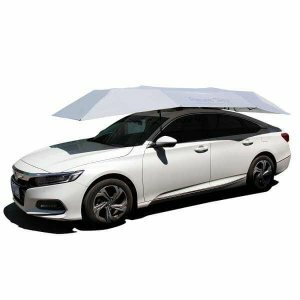 Where can I buy a Car Umbrella? We will present the best performing car umbrellas on today’s market in our thorough reviews, looking closely at the pros, cons and comparisons of each. The most renowned model on the market is the Pro from Lanmodo. Possibly the largest dimensions on the market with the widest variety of sizes, colors and unique features. One of the only covers that utilizes stainless steel and fiberglass in the design. A unique feature is the steel stand, meaning you can actually take it off the car and use it as a standalone tent or shelter, for the beach or camping trip. No other model has this feature. The 1 click set up is pretty standard, with the usual pitch in under a minute. However it also comes with anti-theft measures in the form of extra security features like windproof straps and tie downs. A huge amount of sizes have been manufactured, allowing a compatible fit for the majority of vehicles like sedans, SUV’s, Jeeps and pickups. The militarily fiberglass is stronger than usual and will cover against rainfall, snow and falling debris from trees, construction sites etc. A fantastically designed car umbrella from Reliancer has premium features at an economic price, no wonder it has become one of the best-selling models on the market. 4 season certified with a PU silver coated cover which reduces temperatures significantly during hot days, by up to 25 degrees. 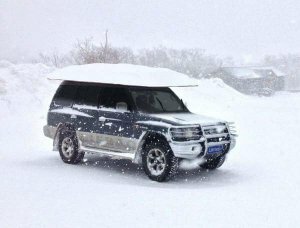 Likewise in the winter during snowfall, the thick polyester prevents water penetration and snowfall. Preventing the screens icing over and holding off snowfall to a depth of 3cm. The cover blocks 99% of UV rays and they have uniquely integrated steel wiring into the framework. Creating stability and also functioning as an anti-theft solution. The use of suction cups are considerate to the car, fastening tightly but not damaging the paint work at the same time. 4 windproof ropes are included and attach to each corner of the cover, providing further stability. The ropes are adjustable in length, allowing compatibility with a wide variety of vehicles. 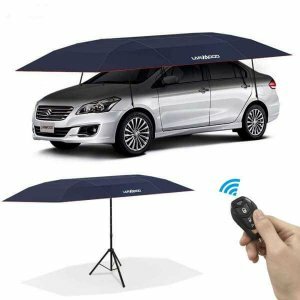 Possible the best-selling car umbrella around, gaining the best choice award on many e-commerce platforms. 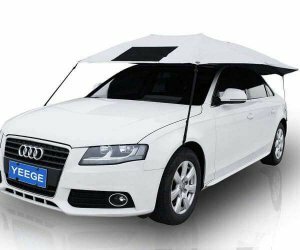 The sun shade from Yeege operates as a quality and feature-full car umbrella. Simplistic installation it can be set up and covered within 30 seconds, with an equally easy unfolding method, stowing away neatly in its carry bag. Great UV protection due to the covers fabric, preventing up to 98% of the rays with the reflective silver coating. Additionally it can cool the interior by up to 25 degrees and the weight combined can help reduce emissions and save fuel. Not the largest model in our list but will generally fit most cars that have less than 7 seats. The real winner on this, is the price, its only $85 which is the cheapest model with decent features you will find. A premium car umbrella with some amazing specs on paper. It has been made in 3 different color choices, blue, camouflage and silver, so it can blend in with your vehicle. In regards to features it includes numerous. Firstly it utilizes a one click set up, in the form of a remote control. It can’t get any easier than that and can be ready within 60 seconds. Lightweight at around 13-14lbs, it won’t weigh down on the suspension. Resistance wise it protects against snow, UV rays, water and additionally rust, so the product won’t erode while outside for extended periods. The 10D Oxford fabric also helps to reduce the temperature within the car by up to 36 degrees, perfect for children and pets etc. Note that it won’t hold up in heavy snow or wind, it can resist a moderate amount, but anything too excessive will cause damage. Use with caution. A 4 season car umbrella that can fit on a variety of vehicles from sedans, pickups, Jeeps and SUV’s among others. Very easy installation with a one touch control, to pitch and unfold the umbrella. Opens up rapidly in under 10 seconds, after a simple 1 minute installation. One of few that can handle 4 season weather, due to the sturdy fiberglass design that protects your car from snow, rain and other debris. The material is also UV resistant, which can lower the temperature internally by up to 35 degrees, perfect for blistering hot summer days. Additionally resistant to wind speed, because of the aerodynamic design, it can withstand up to 13m/s which converts to roughly 30mph wind speeds. This model from IShowstore is a top seller online given the generous dimensions at a reasonable price, offering wide coverage over a variety of vehicles. An elongated design with measurements of 90 x 180 in inches, which is larger than its previous model and is compatible with most cars. 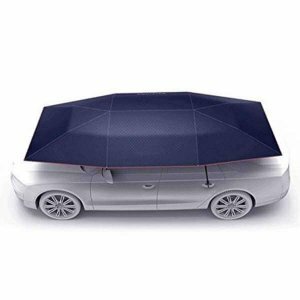 The umbrella also acts as a sunscreen, with a heat reducing membrane in the fabric, keeping the vehicle below cooled. It’s sturdy with 4 supporting points and 6 windproof straps tightening the cover to the frame, keeping it stable and in place during windy conditions. Easily stored, it folds down into a compact storage bag, which can be easily stowed away in the back seat or trunk. 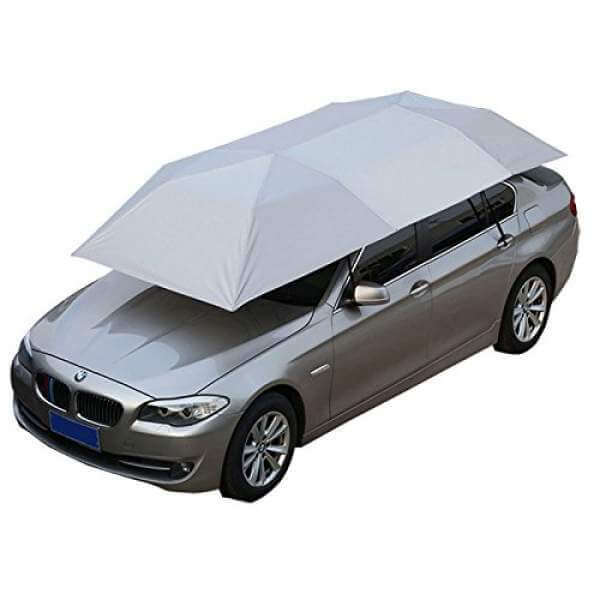 A decent fiberglass frame is used in this car umbrella which is supported by windproof ropes in each corner. A nice feature is the sponge padding they have added, this helps to prevent wearing on the connecting points, providing longevity over other similar priced models. The fabric is UV reflective which reduces internal temperatures and the canopy utilizes a strong and tough material. Oxford 210D provides high density, waterproof and anti-tear protection on the roof of the vehicle. Uniquely it is flame retardant so it is safe beside campfires, bonfires, fireworks and barbecues etc. All necessary parts come included, so no additional purchases are required, providing great value on the already reasonable pricing. A lightweight model at only 9lbs it ensures no additional pressure on the axles and suspension of the car. An automatic umbrella to boot, using the remote control to pitch and fold in one click, additionally can be stored in a free carry bag when not in use. It’s a well-priced car umbrella at around $140, sitting at low-mid range on the market. When opened it measures up at 86 x 138 in inches for width and length which will fit most sedan, hatchbacks and small cars. 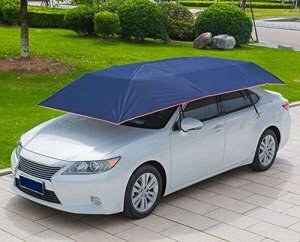 The space between the umbrella and the car is ventilated due to the breathable fabric, reducing temperatures in the car. It boasts being able to hold in strong winds, however car umbrellas generally aren’t designed to withstand this, we don’t suggest leaving it up in gale force winds. A universally compatible car umbrella with the lowest price in our list, the ASY-F is a decent model to test if you are still unsure. With 210D canvas it’s particularly durable and the silver coating provides reflective qualities to repel UV rays, while simultaneously blocking heat. The fiberglass frame ensures zero stress on the vehicle and retaining strength. Like the others it utilizes a remote control set up and it comes with all the chargers, cables and carry bag. In only 1 color choice, but the silver theme has a reflective feel, as opposed to the darker colored models. It’s an automatic lightweight shelter often referred to as a car tent, which sits on top of the vehicle as a form of protection and shade. Protecting from UV rays, bird defecation, paint fade and heat exposure. Utilizing a one click set up by remote control and suction installation, they are incredibly simple to use. There are many benefits to using one. They can reduce the temperature internally by up to 30 degrees, which is great for children and pets when on long journeys or hot summer days. They can prevent bird defecation and leaf accumulation from building up on the paint work, which can cause erosion over time. Additionally they stop paint fade, which happens from continuous hot weather, by blocking the UV rays of the sun. Place it on the roof in the center and pull the suction sucker lever down, it will attach itself securely to the car, like some lightweight models of roof top tents. Turn it on by the switch then open the car door, put the anti-theft tie into the car and close the door. You can now click the remote control button to unfold, it will pitch automatically. Lastly, attach the wind-ropes to the rear-view mirrors and door handles and it’s secured. Car umbrellas range from $120-$400 generally speaking and can be bought at car dealerships, limited physical stores, such as outdoor shops and car accessory shops. But the most popular is probably online, due to the free delivery and ability to compare multiple models simultaneously. Amazon, Ebay and Walmart are the usual go-to choices. They generally aren’t designed to handle strong winds, most use fiberglass or plastic fittings, so use with care and avoid strong winds. Do not drive with the car umbrella pitched on the roof, this will spell disaster, resulting in breakages. Only use when parked. In the case of snowfall, note again they aren’t designed to hold large volume or heavy weight. Some hold more than others depending on quality, but clear snowfall as often as possible. A given, but keep it charged. Remember to plug it in for charging after any extensive use or road trips, you don’t want it failing to unfold when you really need it. All in all a useful and practical shade and shelter for our vehicles that hold more benefits than a simple sun blocker sitting in the window. We hope you enjoyed reading this and if it was helpful or insightful, please share it on your social media page. If you want to learn about some other vehicle shelters you can check out our car canopy article and watch this space, plenty more coming soon. Disclosure: I’m a participant in the Amazon Services LLC Associates Program, an affiliate advertising program designed to provide a means for me to earn fees by linking to Amazon.com and affiliated sites.